Under Pressure, Tronc Recognizes 'Chicago Tribune' Union : The Two-Way In the face of overwhelming support for the labor drive, the troubled media company relented, saying Sunday that it will negotiate with journalists at its Chicago-area publications. 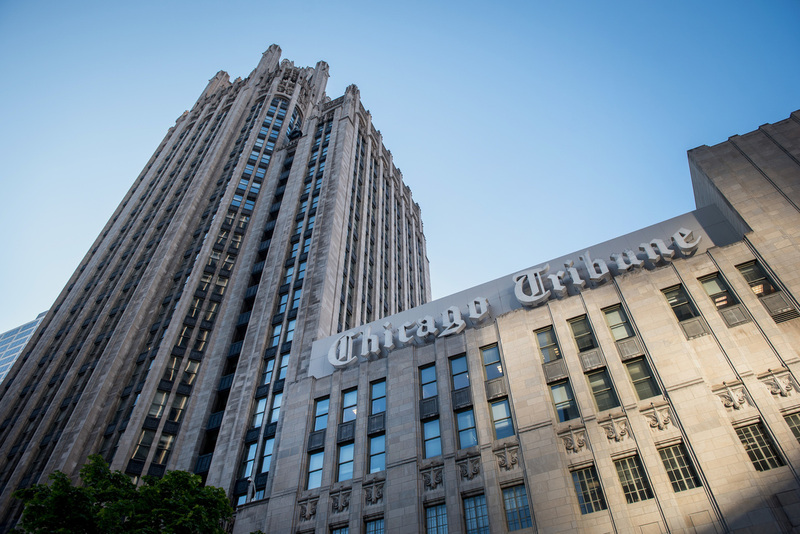 According to labor organizers, Tronc has agreed to recognize three separate bargaining units within the same union at its Chicago-area publications, including the Chicago Tribune. "As we move ahead, we need to be united as one organization with an important purpose — to help the company transform and thrive as a business, and to serve our readers world class journalism," the statement read. This is the second time in four months that a major Tronc newsroom has successfully gone the union route. In January, Tronc was badly defeated in a federally overseen labor vote at its dominant paper, The Los Angeles Times, despite a concerted management campaign to thwart the unionizing effort. Both the Chicago and Los Angeles papers have anti-union editorial traditions stretching back more than a century. Now, both will have unions. Just weeks after the overwhelming vote, Tronc struck a deal to sell the LA Times to one of the parent company's largest shareholders, Patrick Soon-Shiong. That deal has not closed, though it was expected to do so by late April. Labor organizers said Tronc has agreed to recognize three bargaining units within the same Chicago union: one for the Chicago Tribune and the entertainment-oriented tabloid RedEye; a second for the company's suburban publications and the Spanish-language Chicago newspaper Hoy; and a third for the growing corporate-based design and print center that has centralized many editorial production functions for Tronc's publications in Chicago and beyond. The first two union chapters, representing workers at the larger publications and the smaller suburban ones, will engage in joint bargaining with the company. "It's long past time that the journalists at the Tribune and its community publications have a say in how our newspaper operates," said Charles J. Johnson, a Tribune homepage editor who is one of the core organizers of the Chicago Newspaper Guild chapter. "We have been badly mistreated by a series of corporate owners, Tronc only being the most recent, and we've decided to take some control over the future of our journalism in the city of Chicago." In Chicago, organizers said they had collected signed union cards from more than 85 percent of the more than 280 journalists they sought to represent. Tronc leadership and the top executive at the Tribune, Bruce Dold, had initially rejected the organizers' appeal for a voluntarily recognition while saying they shared common goals. "We believe in transparency, open dialogue and fairness. That's who we are as journalists and what guides the Tribune," Dold wrote last month. The reversal of fortunes in Chicago is likely to embolden newsroom employees at other Tronc papers, such as the company's publications in Hartford, Conn.; Orlando, Fla.; and South Florida. The Baltimore Sun newsroom is already unionized. The Chicago organizers cited concerns about noncompetitive pay compared with peers in the industry; fairness in compensation for women and journalists of color; and Tronc's commitment to journalism. Those questions have been echoed at other newspapers of late, particularly those owned by the Alden Global Capital. The editorial page editor of the Boulder Daily Camera was fired for posting an essay critical of the paper's corporate ownership, and the editorial page editor of The Denver Post resigned last week after the paper killed a second editorial he wrote excoriating Alden Global. Former Tronc chairman and controlling owner Michael Ferro resigned in March and agreed to sell his entire stake in the company in April after facing accusations of sexual harassment from two female business associates. His stake was bought by a private investment company controlled by a relative of the late Col. Robert McCormick, the legendary leader of Tronc's predecessor corporation, the Tribune Company. The company is now being circled by potential buyers, reportedly including Japan-based SoftBank. The Tribune labor organizing effort not only drew inspiration from the Los Angeles efforts but also was fueled by a series of revelations about Tronc's business performance and corporate decisions, including compensation of executives. Tronc agreed to pay Ferro $5 million a year as a consulting fee even as he served as chairman of the board. The company's CEO (and new chairman) Justin Dearborn, a longtime Ferro aide, was given a compensation package in excess of $8 million last year. The former CEO of the LA Times, Ross Levinsohn, was given $6.9 million in pay and compensation last year, despite starting in late August. Levinsohn was sidelined after NPR raised questions about his past workplace conduct but is now Tronc's digital CEO. "The people who do this work at the Tribune — and I think this is true generally, and especially at American newspapers — do this work because they believe in its importance, and because they believe it is essential to the functioning of a democratic society," Johnson said. "This work is done as a labor of love. But as pay and benefits continue to erode, and as mistreatment by corporate ownership continues not only at Tronc but at other employers as well ... people wonder if this is work they can continue to afford to do."